Department of Computer Science students returning from industry placements demonstrated their professional achievements with a poster showcase. The Professional Liaison Unit (PLU) ran its annual poster presentation day on 14th June for the 45 Computer Science students returning from a year in industry to showcase their experience and achievements during their placement through a poster presentation. Staff and students were invited to attend the event to meet placement students and their employers. They were able to learn about the work the placement students have been involved in, and how this has enhanced their employability and professional development. The successful event enabled all participants to see how City’s students have applied the knowledge gained in the classroom to real-life business challenges. 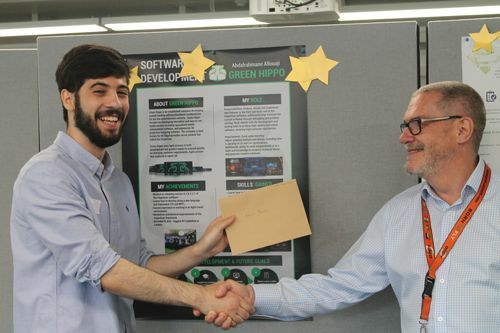 Employers attending the event awarded Abdalrahmane Allouaji (working for Green Hippo) the First Prize (£50 Amazon Voucher) for his poster and Anvi Patel working for VMware Second Prize (£25 Amazon voucher) for her poster. Richard Basch, Chief Operating Officer of the School of Mathematics, Computer Science and Engineering, presented the prizes to the winners. First Prize winner, Abdalrahmane, was a software developer working on a unique software solution for the Hippotizer media servers. Though it was a "new experience working in a professional team and without any prior knowledge working on a large and somewhat legacy code bases", Abdalrahmane learnt many new technical skills such as C#/WPF and various design patterns to make his code "maintainable, robust and stable". For Anvi, VMware was "a dream to work for". She said the company "not only granted me an opportunity to work with the most amazing people, but has made me strengthen my focus on everything I ever wanted to achieve. My biggest highlight while at VMware was the opportunity to gain a PRINCE2 Foundation and Practitioner qualification. This was a big step in my career as the qualification is a credited Project Management qualification." Abdalrahmane and Anvi's sentiments were also echoed by fellow placement students, Husban Ahmad (BlueBay Asset Management), William Musumba (GSK), Usamah Sakira (Allianz) and Alexandria McLeish (Interoute).